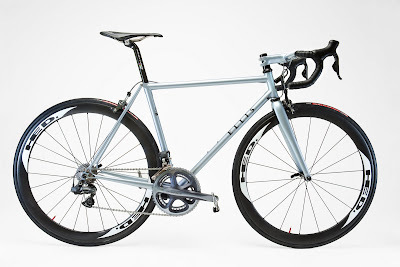 The Di2 bike is BOTW, (bike of the week), at NYC Velo! Andrew, the owner of NYC Velo offered to help me find the bike a good home, so I brought the bike along to D2R2 and handed it off to them. It's been on display in the shop for the last month or so, and they've decided to highlight it in the BOTW segment on their blog. I've known Chris for about a year and half now, after meeting him at the Cirque in 2009. He approached me just as Lisa and I were packing up bikes and displays as the "show" at the Loudon County fairgrounds was winding down. 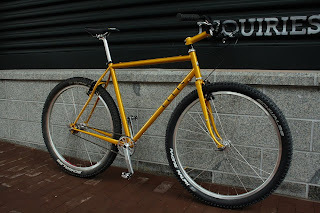 We chatted a bit, and then about a week or two later he contacted me to see if I would consider selling my 29'er. I thought to myself, "that's my bike", but then it occured to me, "you can build yourself another one, dummy! ", and I finally capitulated and sent it on it's way to Chris. Well, I see the yellow Ellis pop up in Chris' Flickr pictures pretty often, so he must be enjoying it, and we've run into each other a few more times now, NAHBS in Richmond, Cirque again in VA, and most recently at the D2R2. So, this summer Chris called me about ordering a road bike, but as we talked, I could tell he was having a tough time making his mind up on what to build. 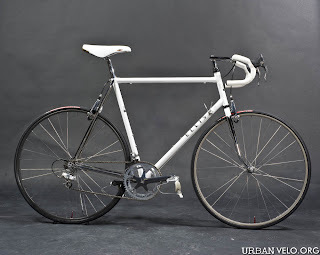 A Modern Classic, a 953, or something like my personal show bike from this year's NAHBS, below. I knew what Chris liked about all these bikes, so I finally came up with a suggestion that we both agreed to. I'd build Chris an awesome bike, but it'd be a complete secret until he opened the box. We discussed his geometry, I sent him a copy, but as for styling, all I had to go on was our conversations and his comment, "I already have a yellow and a green bike, so something else". Well, I've just about finished the frame, it needs some polishing before it heads to Jason for paint, but I can't post any pics! Arghhh... Suffice it to say, it turned out pretty badass, and I'm excited to see it with paint. Stay tuned, probably less than a month till the unveiling. p.s. Chris recently moved to NYC and he works part time at NYC Velo. Check out his account of D2R2 on their blog here; http://nycvelo.com/blog/2010/09/d2r2-ride-report/#more-2054.